From time to time my place turns into Hamlyn. The rats love the thick layers of roof insulation to snuggle into, the tasty fruit trees in the garden, the drinking water in the pond and the snacks available from the bird feeding table. It is nothing less than a rat resort. The only marked difference between this and a hotel with a Bali Hai bar in the swimming pool is that all the residents must die. And when I hear the familiar sound of a rat gnawing away on the chunk of poison, part of me wants to cry out, “Don’t touch it!” just as you would if you’re watching a film where the toddler picks up Daddy’s loaded pistol. The other half is doing a cheer leading routine. The rats disappear and we never find any trace of them again for another year. Rats are nothing new to me. We have rats in our shack in the country, which is not surprising given that we are surrounded by a macadamia plantation. When we first built the place you only had to turn out the lights and you’d hear the patter of little feet tap dancing across the beams, taunting us with, “Nah, nah, you can’t see us!” Each morning I would climb the ladder and nail more bits of wood over holes I believed were the latest entry points, ignoring the sound of rats sniggering as they watched me from their secret bunker. But one day we arrived and there were no trace of rats. Hurrah, I cheered, hurrah for my clever eradication programme that has dealt the rat menace a final blow! 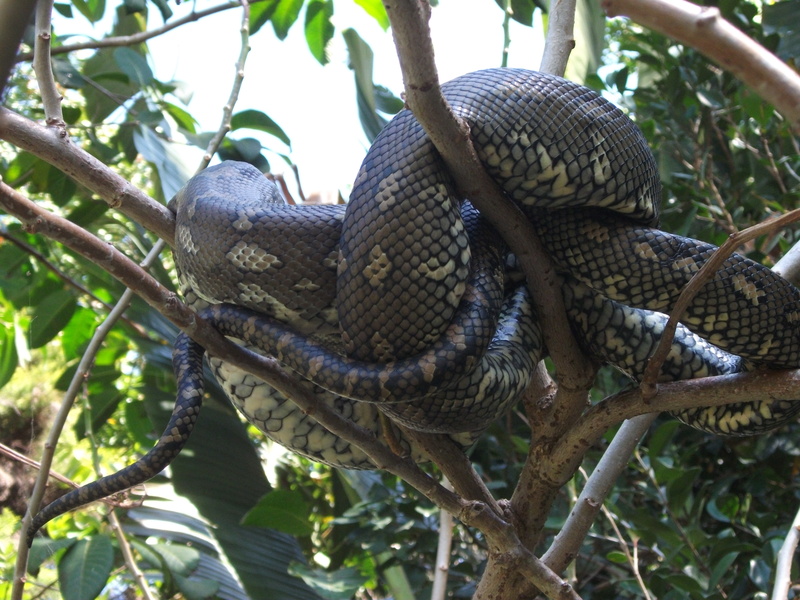 There’s nothing better than a carpet python to eradicate rats, as people are always telling me (although perhaps only in Australia). People advise you to place one in your roof space as though you might add that to your shopping list (“milk, eggs, and check out the specials on carpet pythons”). And whilst I think tweaking the eco-system in your favour makes great sense, it did take me a while to come around to the idea. Carpet pythons are huge snakes with a patterned skin that obviously reminded someone of a carpet although in fact it is much more like lino. A lino python sounds more rigid, I suppose. They’re not particularly bothered by humans and only ask for a warm spot to sleep and the odd rat or small dog for lunch. I first came across one whilst staying at my friend Chris’ house in the country. I had been wandering around the garden and was kicking off my boots on the veranda when I thought: funny, that enormous coil of rope wasn’t there when I left. Which is when I noticed how the coil of rope had an elegant head. It shot me a bored glance as I backed through the French windows, my mouth open in one of those silent screams you think you only get in dreams. And then Chris bounced into view on his ride-on mower. His eyes narrowed when he saw my pale face at the window and he got off the mower and started to walk towards me. “A snake!” I mouthed through the glass, pointing furiously at the veranda and contemplating the loss of bladder control. I realised I would have to watch a dear friend being consumed by a serpent. “Run! Run for your life!” I shrieked through the window, horrified to see him bend forward to get a better view of the snake. “It’s only a python,” he said. Which sounded to me like: it’s only an envoy of Satan, what possible harm can it do? And he got back on the mower and proceeded to cut the grass. After an hour of contemplating the snake from behind the breath-steamed glass of the window, I began to admit that the snake was in fact quite a beautiful thing. I have lost my fear of them now, knowing that they are the rat catchers par excellence and I lower my head reverently whenever I see one. It has a job to do. I’d consider getting one for the roof space in Sydney but I don’t think I could handle walking down the street past the Missing Dog signs posted on the lampposts and the way the neighbours might start deliberating over why Schnoodles was last seen wagging his tail as he walked down our drive to investigate something unusual. At heart I am a sentimental animal lover. I lock eyes with dogs that pass with their owners and we share an understanding that sometimes life isn’t all it’s cracked up to be. I pat cows in fields and say hello to the fat spiders that lurk somewhat unwisely on door-frames. Even now, as I scatter poison into the roof space, I think how wonderful the gift of life is and how sad it is that I am about to cause the demise of several. And then I make a pot of tea.